A small team of researchers with Imperial College London, the Natural History Museum in London, Project Stardust in Norway and Université Libre de Bruxelles in Belgium, has found samples of cosmic dust in the gutters of buildings in three major cities. In their paper published in the journal Geology, the team describes how they found cosmic dust particles the samples, what they look like and what they may reveal about the origins of the solar system. Up till now, researchers looking for space dust have usually had to travel to the Antarctic – it was thought the tiny particles, believed to be left over remnants of the formation of the solar system, would be too difficult to find in places where there is a proliferation of other dust types, particularly in areas where people live. John Larson, an amateur space scientist with Project Stardust, came to researchers at Imperial College suggesting that maybe space dust could be found on rooftops. The team traveled to Oslo, Berlin and Paris and obtained 300 kilograms of dirt samples from rain gutters on rooftops. Back in the lab, they used magnets to pull possible cosmic dust grains from within the muck. They report that they found and identified approximately 500 samples. The team also report that the dust grains they found were larger than those typically found in Antarctica – they measured approximately 0.3 millimeters as opposed to the customary average of 0.01 millimeters. They also noted the grains had fewer feather-like crystals than those found in Antarctica. They suggest the differences are likely due to age – those from Antarctica are typically much older, which would mean the planets would have been aligned slightly differently when they fell to Earth. 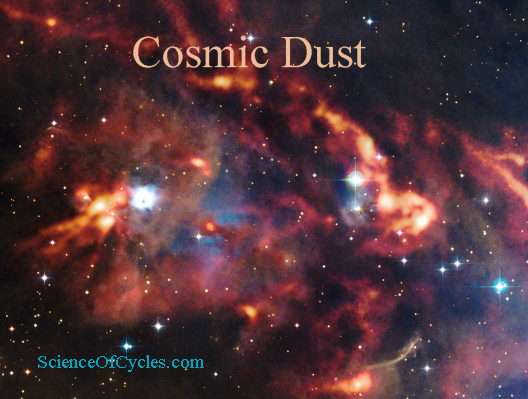 That differences indicate dust particles falling through the atmosphere would have been traveling much faster in more recent times due to a difference in trajectory – up to 12 kilometers per second, the fastest ever recorded for space dust. Those differences may illuminate the movement of the planets relative to one another over time, helping to understand the history of the solar system.